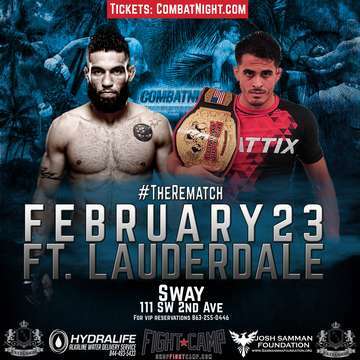 Combat Night comes back to Fort Lauderdale with an event at the brand new SWAY Nightclub. We have a great line up with all the local gyms coming out to be a part of the event. Vagner Rocha Martial Arts, Rock MMA, American Top Team, UFC GYM, Carlson Gracie BJJ El Tigre, Zen JiuJitsu and others will all have guys stepping in the cage to put on a show for the fans. If you have any further questions about the event or would like to learn more about Combat Night, check out our Facebook page, www.Facebook.com/CombatNight.